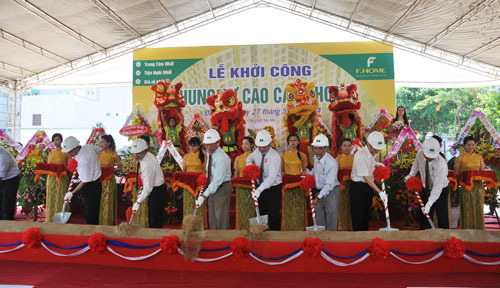 The central city's food joint-stock company, Danafood, began construction of its first commercial housing project in the downtown area, with a total investment of VND600 billion (US$28.6 million), on Tuesday. The project, which covers an area of 4,100 square metres, with two 25-storey building constructions in Hai Chau District, is scheduled for completion by 2016. The apartments will be sold at VND13.5 million ($640) per square metre for a total of 680 apartments. "Buyers can gain ownership of an apartment with only VND150 million ($6,700) under the government's VND30 trillion ($1.4 billion) package for low-cost housing," Director of Danafood Pham Tan Cung explained at the ground-breaking ceremony yesterday. ""We offer sales promotion programme for buyers with a retirement pension book, savings books," Cung added.